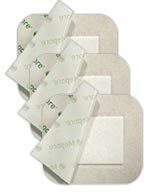 Molnlycke Mepore Pro (3.6" by 6", part number 671090) surgical dressing is ideal for wounds with low to medium amounts of exudate (minor burns, cuts, or abrasions). It is easy to use and highly absorbent. Pack of 6 boxes (40 dressings per box). Molnlycke Mepore Pro (3.6" by 6", part number 671090) surgical dressing is ideal for wounds with low to medium amounts of exudate (minor burns, cuts, or abrasions). It is easy to use and highly absorbent. Sold as a pack of 6 boxes (40 dressings per box).